Cover the globe with a pack that you can roll with ease or carry like a backpack. Featuring a trampoline suspended mesh backsystem, the Sojourn offers maximum levels of comfort and ventilation. Complete with a zip away, torso-adjustable harness and hipbelt, this travelpack offers a superior carrying platform for your global adventures. Your wheeled travel requirement is covered with the durable and unique injection molded HighRoad chassis, consisting of an ABS polymer plastic for durability and using polyurethane wheels. Sealed bearings in the wheels, coupled with good ground clearance allow a smooth rolling motion on almost any surface. The double-bar, retractable ErgoGrip handle ensures that wherever you go, your bag will follow. Inside the bag you will discover a multitude of organization options; including a liquid/accessory pocket that is compatible with the Osprey Wash Bag Cassette (sold separately) and dual mesh pockets to separate dirty clothes and shoes. The internal compression straps allow you to fully maximise capacity whilst securing your clothes and limiting creases. 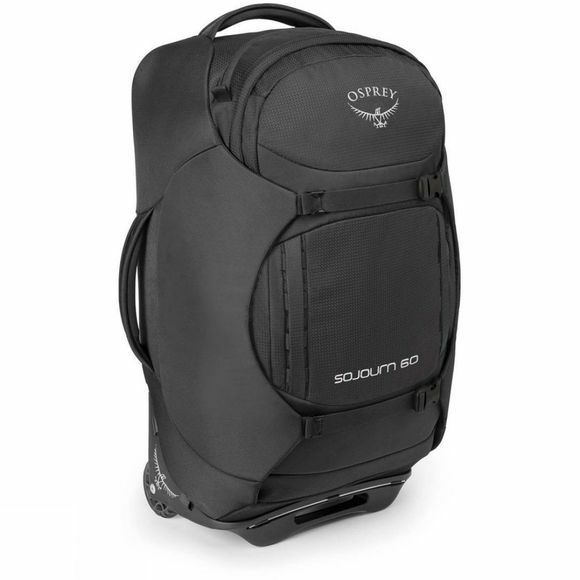 For the ultimate in gear protection, the Sojourn spreads its foam StraightJacket side-wings around the bag to compress, stabilize and protect your belongings. 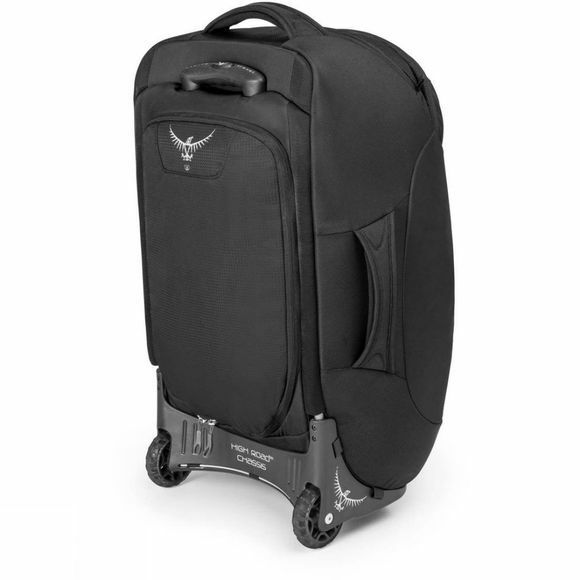 These wings cleverly wrap from one side of the bag to the other when you’re hauling less gear than usual.